Fr. Petrus Puspobinatmo SJ is an Indonesian Jesuit who works in Thailand. 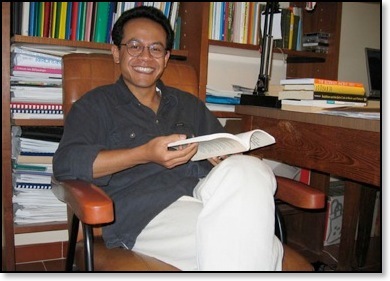 He was born in 1968 in Muntilan in Central Java, and entered the Society of Jesus in 1988. 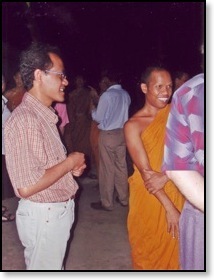 After his novitiate in Girisonta in Central Java and Philosophy in Jakarta he did his regency in Thailand. During his regency he assisted in pastoral work at the University student chaplaincy, and here he assisted at many work camps where several Buddhist students participated. Later he started his theology at Gregorian University and was ordained a priest in the year 2000. Right now he is pursuing his doctoral research at the Institute of Spirituality in Gregorian University, and he is working on the topic of Comparative Spirituality. The title of his dissertation is Ignatian Spirituality meets Buddhist Wisdom: Human Maturation as an Integral part of Spiritual Progress. A Case Study in Thailand. Petrus has decided to work on the method of spiritual progress taught by ACARIYA MUN BHURIDATTA THERA (1870-1949), the founder of the Forest Tradition of Theravada Buddhism in Thailand.